This is a guest post by Kevin Allen, Head of Insight at RateSetter. Credit management and consumer trust: the words are inexplicably linked for the majority of financial services providers, particularly those dealing with personal finance. In fact the approximate to translation of the Latin “Creditum” meaning a loan is to the French “crédit” meaning trust. There is little doubt that consumers are increasingly alive to the mechanics of how institutions are looking after their hard-earned money – something that has stemmed from the global financial crisis when banks were guilty of lending household savings to all sorts of risky endeavours, with well documented results. There is no clearer example of the importance of credit management than within the peer-to-peer lending industry. In the absence of the Financial Services Compensation Scheme, the biggest single risk to lenders is that borrower defaults reach a level so severe that it absorbs not only the interest they might earn but their capital as well. RateSetter were the first peer-to-peer company globally to introduce the concept of a provision fund that provides lenders with an added level of control against loss of even the expected interest amount. The provision fund has proved very successful, not only in providing lender confidence, but also in terms of its track record. We also aim to gain depth and breadth to our lending portfolio through an evolution of our offering. This will always include our core consumer lending offering for customers to buy cars, make home improvements and consolidate expensive credit card debt, but will include property development and commercial business lending to support the UKs SMEs. So, although a peer-to-peer lender can rely on us to manage the Provision Fund, this leads us to the natural questions: who exactly am I lending my money to? And, how much are they contributing to the fund? So everything we say and do is built around careful and cautious credit assessment and any potential impact on the provision fund. But, equally important to the mechanics, is the transparency for our users. While banks and building societies still, even today, maintain an impenetrable barrier for users trying to understand what is happening to their money, we have gone to the opposite end of the spectrum, making openness part of our DNA. RateSetter members can find a wealth of data on the web site itself which is updated by a live feed from the core back office system. RateSetter have also made available the entire loan portfolio for download from the AltFi web page for analysis by enthusiastic Dataphiles. Of course not everything is easy. Direct lenders, albeit P2P lenders or American monoline credit card issuers, face an additional hurdle in assessing customers because we do not have access to the current account. This makes identification and accurate assessment of affordability difficult, and has resulted in RateSetter over-compensating for this weaknesses through the use of other technologies. RateSetter has external links to two of the UKs premier credit reference agencies and business credit rating agencies Graydon and Dunn & Bradstreet. Additionally we use sophisticated identification tools from the likes of CIFAS and tools more commonly used by the telecoms industry’s for anti-fraud. Also having built the entire lending platform in house, we have incorporated a number of additional data matching and fraud avoidance techniques based on our personal industry experience and ongoing iterative learning. It is in the growth of additional data sources and the identifation of fraud where I think RateSetter has grown strongly in the last 18 months, and although a strong history of data helps it is our personal experience and current assessment techniques that are paramount. That said, we continue to identify new sources of data and constantly improve. Not only do we check a borrower’s credit rating we have introduced affordability checks as well. These ensure a borrower’s repayments are comfortably covered by their disposable income so funds are available to cover unforeseen expenses. Income is an important element of this assessment and is verified in a number of ways, both at the time of application and retrospectively using the Current Account Turnover (CATO) data provided by UK banks to the credit reference agencies. Interestingly this analysis shows that the customer’s self-stated income is not only accurate but often surprisingly modest of their higher true income. 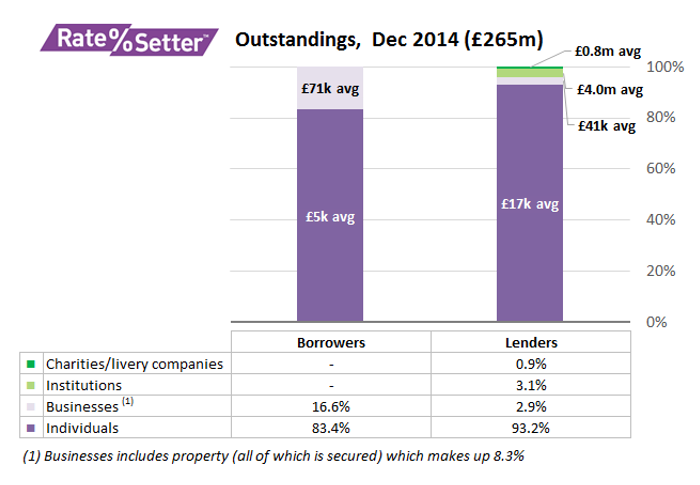 RateSetter collects 22 different reasons for loan applications that have been declined, with rejections due to income and affordability representing approximately 11% of this total. Despite the extensive automated collection of data from multiple sources, RateSetter continues to prefer to make the majority of final loan approval decisions manually. This allows us to avoid the “computer says no” simplicity, and be sure the customer understands the loan functionality and can afford it. Making contact with the customer allows us to build the relationship and better understand their ongoing needs. RateSetter also makes extensive use of data with the newly formed ‘Insight’ team having direct “mirrors” onto all of the customer data from applications, credit checks, affordability checks, pricing, approval, payment performance through to possible collections and default. The databases have been built from scratch and provide a detailed “customer” overview, helping RateSetter avoid some of the data access and cross-product issues that the traditional banks have where departments often operate in silos. All this access gives us a more holistic view of an individual. As much as our default ratio is one of the lowest in the industry (and have the largest Provision Fund of its type globally) we have seen the lessons learnt by overly complacent banks in the crisis and are alert to the very real threat of rising default rates. To ensure our Provision Fund has sufficient funds we implement regular scenario testing to identify the coverage ratios as reported on the web page; currently showing an excess of 68% to what is actually expected to be prudently required. Our scenario tests include modelling performance based on Equifax ratings, actual performance, recent collections roll-rates and cure-rates and two “apocalyptic” scenarios that imagine the peak bad debt levels enjoyed in 2009 as a result of the global crisis persists for the next 5 years. It is precisely this openness combined with a focus on transparency through data that has led us, and peer-to-peer lenders in general, to enjoy such high levels of trust from consumers, which, in turn, has driven our growth.